Stony Ridge Farms sells beef in two different ways. First, we offer our beef by the package/cut, from our farm or weekly at Cottin's Farmers Market. At market you'll find our 100% Grass Fed and Finished, Gourmet Ground Beef in one pound packages. (All the great parts, including steaks and roasts, go into this great ground beef) as well as select cuts of steaks, roasts. stew meat, ribs, soup bones and organ meats. We also sell our Gourmet Ground Beef at discounted bulk prices, when purchased in quantities of 25 pounds or more. The second option is our butcher beef. We butcher several cows a year. We offer our butcher beef in whole, half, split cross section 1/4's and even 1/8's! We want to make it as easy as possible for you and your family to enjoy eating health. We know freezer space can be an issue, so buy as much or as little as fits your needs. The best prices are of course for the larger amounts. When you purchase a whole or half, you may request a custom cut list, having your beef cut to your personal preferences. Our 1/4's and 1/8's, when ordered as such, are by our standard cut list only. However, to get the best pricing, along with a custom cut list, while still purchasing smaller quantities, all you have to do, is Cow Pool! Gather up a friend or two (or more) and purchase a whole or half together! You gather all the money together and place your order. We'll pick the beef up when it's ready and deliver it to one location, where you and your friends can divide it however you wish! Read below for more details. Our Beef is raised without hormone/steroid enhancers. Minimal antibiotics are used to ensure the health of the animal. "You are what you eat" and so is your beef. Lots of TLC goes into STONY RIDGE FARMS GRASS FED BEEF. From our pastures to your freezer, care is taken to ensure quality. 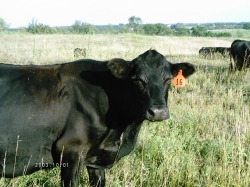 Our cattle are raised on pasture, rotational grassed for better health for the animals and better health for the land. Beef Age - Stony Ridge Farms sells "yearling" beef. The conditions in which our beef is raised, along with it's age, make our beef leaner, with less cholesterol than the older "market" beef commonly found in the supermarket. Being grass fed and finished also means that the fats that the beef does contain, are the fats that are good for! Our beef is available in whole, half or *split-half cross sections. Multiple individuals are welcome to purchase a section together to better fit their needs. We also offer 1/8 bundles when we can, for those with smaller freezer space. Slaughter and Storage - Your beef is taken to a certified butcher and meat processor, where it is custom-cut to your specific needs. *Split-half cross sections and bundles are not available for custom cut, but by standard cut only. For your convenience, we are happy to pick up your beef and deliver it to you. *Split-half cross section is a quarter of a beef, but equally divided between the rear and front sections so that you have a nice selection from all of the various cuts. Contact us for further information or for references on the quality of our outstanding beef!